Roland's JUNO synths are known everywhere for their great sound, ease of use, and exceptional value. The JUNO-DS88 takes the iconic series to a new level of performance, adding many powerful enhancements while still keeping operation streamlined and simple. Equipped with 88 weighted-action keys for a premium feel, the versatile, intuitive JUNO-DS88 puts you in creative command, making it easy to produce exceptional music everywhere you play. 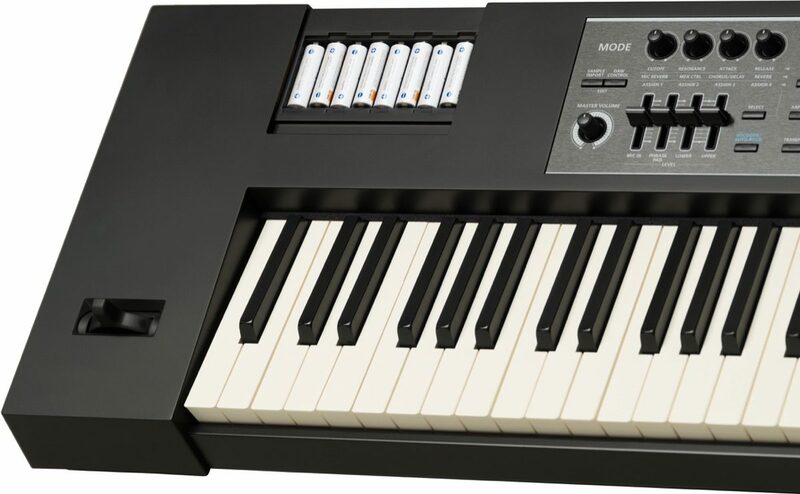 The JUNO-DS88 features 88 weighted-action keys, a first in the long history of the JUNO series. Roland's Ivory Feel-G Keyboard with progressive hammer action is an ideal complement to the expressive new piano sounds, providing high-end touch and playability while still keeping the instrument light and mobile. This makes the JUNO-DS88 an obvious choice for pro players, as well as piano students looking for a portable, versatile instrument to learn on. One thing that's made the JUNO series a players' favorite is its instant-access design, which makes it easy to call up fantastic sounds right away. But if you like to dig in and customize, the JUNO-DS88 now offers even more adjustable parameters than before, allowing you to tweak patches and performances with detailed precision. The front panel provides an expanded array of hands-on knobs and sliders for creating patches and adjusting sounds as you perform, while the rear panel features jacks for connecting hold and expression pedals at the same time. To complement its impressive onboard sound set, the JUNO-DS88 supports internal waveform expansion via USB for unlimited tonal range. Over 1000 EXP sounds are available for free download at Roland's Axial website, including top-quality acoustic piano collections, world instruments, go-to studio standards, percussion, loops, and more. Overall: I am an experienced guitar player who has messed around with keyboards for years. As I've gotten more serious about keys lately, I comparison shopped Yamaha, Roland and Korg in this same approximate price range. There are a number of good reasons why the DS88 was the right choice for me. First, the keyboard has a sensitive touch and feel almost identical to my upright acoustic piano. Second, to collection of tones - I probably will not end up using them all - is tremendous. Grand piano, different textures of synth tones, horns, strings, its all here. As I am now learning, being able to split the keyboard, layer multiple sounds and store my favorites makes this keyboard (although pretty long in size due to full size 88 key) a solid candidate for gigging with. Third, the sounds are easy to navigate and get to. This, for me, was a critically important thing. Can I play out and quickly jump between sounds at a live gig. Reason number four: zZounds top flight support and payment plans. I had questions before the sale on this Roland and zZounds had people who really seemed sharp, on call to help me through those questions. The topping of all of this are the easy payment plans offered which puts a great piece of gear like this, in reach of a person who is dedicated to his or her craft but maybe does not have all the money up front. I could not be happier with this Roland, or with zZounds. Simply a great combination. Highly recommended not only to keyboard players, but also to crossover players such as me who want to broaden their expressive tonal palette in music beyond guitar. Style of Music: Trained jazz musician but versed in many styles of music from blues, rock, new country, Christian contemporary, pop. 34 of 35 people (97.14%) found this review helpful. Did you? Overall: Like any keyboard the Juno DS88 has its limitations but, overall, this is a great instrument. Most of the sounds are excellent, though there are some that I will probably never use. The manual, included with the instrument and those which were downloaded from Roland, are well written and easy to understand. The 88 key keybed has an excellent feel as it feels like a well built piano. Did not need manufacturer support at this point. For the price, this product is hard to beat. I am very pleased with this purchase from zZounds and I would recommend this keyboard to anyone looking for an 88 key instrument that is designed for the working keyboardist. Roland scores big with this one!! 28 of 30 people (93.33%) found this review helpful. Did you?